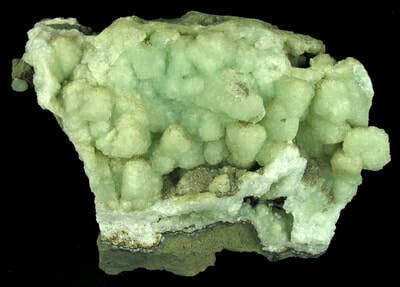 Prehnite is a calcium aluminium silicate hydroxide that belongs to the Phyllosilicate sub-class of minerals. Its crystal system is orthorhombic. It usually occurs in massive, botryoidal, granular or stalactitic habits, but can also (rarely) form prismatic, pyramidal or tabular crystals. The colour is usually pale green and yellow-green, but it can be bottle green, yellow, white, grey or colourless. Prehnite it translucent to transparent with a vitreous, waxy or pearly lustre. Prehnite is found in Australia, China, South Africa, Scotland and in New Jersey, USA. Prehnite was named after its discoverer; Colonel Hendrik von Prehn who brought back the mineral from the Cape of Good Hope in South Africa to the Netherlands. It is an attractive collection mineral that is occasionally used for ornamental stone purposes. Prehnite is a good Feng Shui stone, it helps you de-clutter, removing things that are no longer needed and organising those that you wish to keep. It helps people who have a tendency to hoard useless possessions or old loves. The current thinking is that hoarding could be a symptom of obsessive compulsive disorder. Prehnite will calm the desire to collect and help you trust in the universe. Prehnite is useful for supporting the health of bones, teeth, hair and nails. It amplifies the ability to endure physically stressful situations over long periods of time when you might otherwise feel weathered and weary. 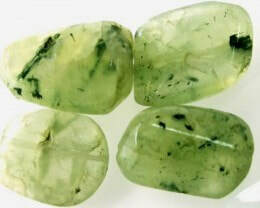 Prehnite is beneficial for careers involving extreme attention to details like accountants, editors, surgeons, nurses, seamstresses and tailors. 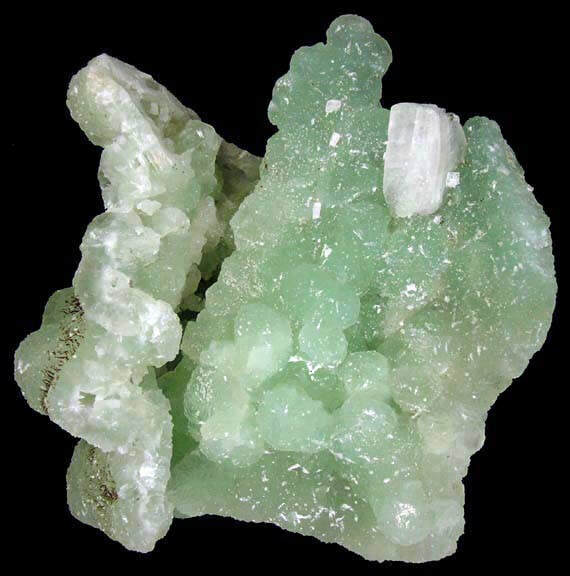 Prehnite stimulates the metabolism of fat and accelerates the removal of toxins stored in it. This stone stimulates all regeneration processes of the body. Prehnite helps balance and heal the circulatory system and the lymph. It can assist in clearing toxins and wastes from the body through the lymphatic and urinary systems. It is useful in calming infections of the urinary tract or the glands. Prehnite is useful for diagnosis of diseases. It is helpful for healing the kidneys, bladder, thymus gland, shoulders, chest and lungs. It treats gout and blood disorders, repairs the connective tissues in the body and can stabilise malignancy. 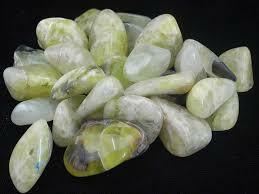 Prehnite assists in dealing with feelings of unrest during times of constant change. This stone of transformation can help you see and feel how the end of certain conditions can be beneficial for the evolution of your body, mind and spirit, It opens your awareness to see the good in all things. ​Prehnite helps you to face up to avoided images and memories and to dissolve unpleasant feelings unconnected with them. This stone does not itself throw up many memories, but it helps at moments when they are activated and become acute as a result of new experiences. Prehnite is a gentle, nurturing stone that can help you release constant identification with past wounds. It is like ‘emotional soap’ that helps wash emotional debris from the aura. It can act as an emotional ‘rescue remedy,’ helping you to immediately release identification with emotional wounds and preventing little hurts from growing into festering emotional sores. 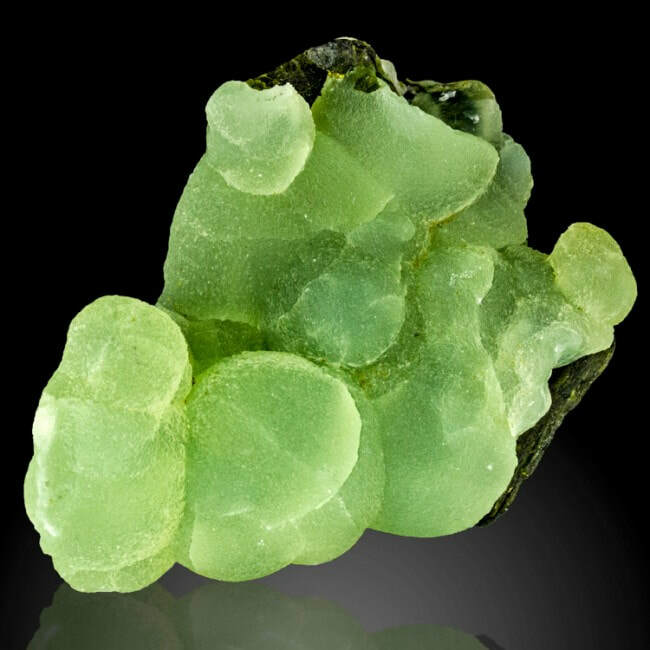 Prehnite aids in cooling and grounding excessive anger or nervous energy, encouraging a sense of peace and calm. It helps renew one’s chi and strengthens the flow of vital energy in the body. Prehnite is a stone of unconditional love and the crystal that will heal the healer. ​Prehnite eases nightmares, phobias and deep fears uncovering and healing the problems that create them. It his helpful for people who hyperactive. Prehnite helps you stay awake and alert when you feel mentally weary. Use this stone to help you stay focused and renew your attention on the matter at hand. This stone is ideal to help you release the incessant chatter within your mind. Prehnite helps you sort your thoughts, helping you understand what is truly important. 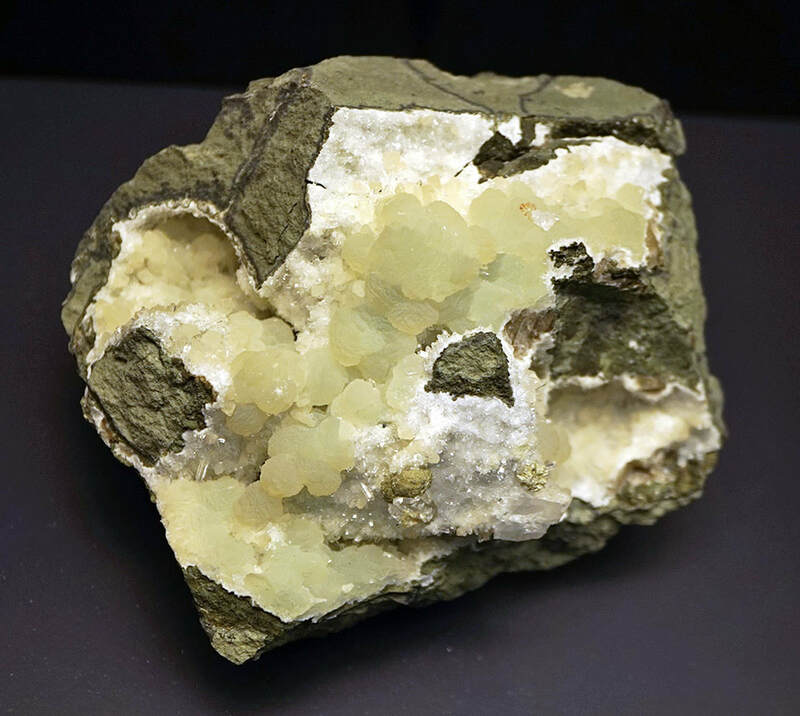 Prehnite encourages analytical thinking and accelerates the processing of sensory perceptions. This stone imperceptibly but continuously increases your perception levels. Prehnite helps you stay in the present moment and avoid the unhealthy use of the imagination such as visualising all the disastrous possible futures that you could encounter. Using this stone in meditation, you can ‘hear’ the currents of angelic communication, the guidance of spirit beings, or the song of your own Higher Self. 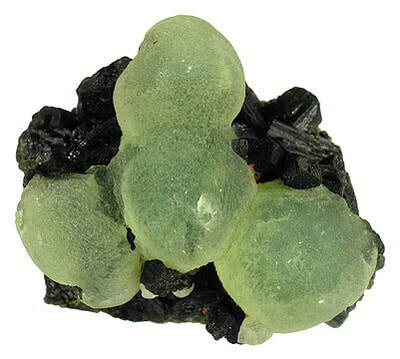 Prehnite can also help psychics and intuitive readers be more accurate in their predictions. It enhances the visualisation process and induces deep meditation in which the higher self is contacted. When meditating with this crystal you are put in touch with the universes energy grid. Prehnite helps precognition and inner knowing. It is a stone that enables you to always be prepared, no matter what. Prehnite increases prophesy and shows you the way forward for your spiritual growth. Prehnite is a perfect stone to help integrate the spiritual teachings of the impermanence of all things into your everyday life. It aligns you with the vibrations of peace and renewal inherent in the constant changes of the universe and releases the feeling of being challenged by them. Use this stone for meditation practice in contemplate the impermanence of life and the cycles of creation and destruction. 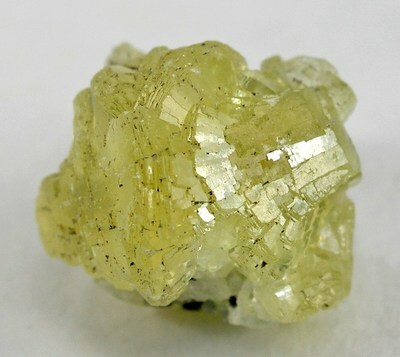 Prehnite helps dissolve avoidance and substitution mechanisms. It also helps you to accept unpleasant truths, helping you to understand your own identity. Prehnite offers a reflective, calm vantage point from which one can explore the nature of your experiences. It facilitates a heart centred connection to all of creation.